02:30 – How many podcasts can you run? If you can talk and if you have some basic recording equipment you are almost there. You need to submit your podcast to iTunes once using a free plug-in (I recommend blubrry) and then it will automatically upload every time you publish. Portable device usage is increasing. You can also reach people who would not ordinarily read text or watch a video. An astounding number of my listeners report to me they listen whilst walking the dog or in transit. When you interview an expert it is great for your audience and also an excellent opportunity for you to learn more about your field of specialty. If you want to learn something new simply locate an expert in that area and invite them to be a guest on your podcast show. Publishing a ‘show’ builds reputation the same way that publishing a book does. For some magical reason when you have a published show in iTunes people perceive you to be a publisher and will lend more attention to your message. In order to increase sales for your own products and services you need to be in front of a wide audience. When you continue to deliver valuable content all the time people appreciate your value and naturally follow your links to products that you recommend. When I survey my community at live events a substantial portion of them first heard about me via a podcast. When people listen to other podcasts in your market or business or category they will see your podcast show up underneath it and it is a great way for them to find out about your podcast. This makes podcasting a very leveraged activity. I run three podcasts. One of them is a joint venture with Tim Reid called FreedomOcean.com and it is a lighthearted show with expert teaching Novice angles on the topic of Internet Marketing. InternetMarketingSpeed.com is where I place high-level interviews and posts where I will read out my text to make sure that my messages spread across multiple mediums. 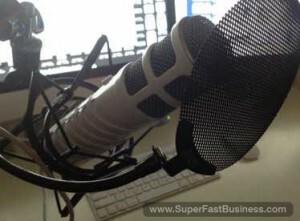 SuperFastBusiness.com is a great regular podcast because the audio is stripped out from the videos and used as an alternative way for my listeners to access the high-value news tips each few days. The result is I have three different podcasts that reach different audiences and combined downloads of almost 30,000 listens per month. When you speak with others on the podcast it is a great opportunity to make a joke and to record a life moments. This is much the same as you experience with your home videos or pictures, you’re creating time capsules that you can use over and over again and many new listeners will be introduced to your show in the future with material that you have only done once. Podcasting is an excellent way to create engaging, fun and valuable content for you and your listeners to experience now and in the future across multiple devices in multiple media formats. I consider podcasting essential for my business. Any expert,author, product creator will benefit from an effective podcast. I also cover podcasting traffic strategies in TrafficGrab. If you love this episode, please leave a comment or rate us on iTunes.